Since 1991, Jeffrey Court has been crafting incomparable handmade tiles that reflect our passion for craftsman quality and inspired design. 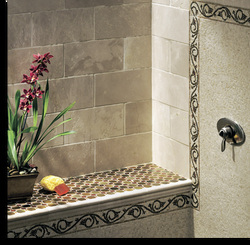 Known for our distinctive styling and wide assortment of decorative tile, stone, glass and metal covering materials, we provide elegant products that make any installation extraordinary - all at incredibly affordable prices. Our state-of-the-art manufacturing plant combined with a 90,000 square foot warehouse and showroom, gives us the ability to respond quickly. With a fantastic assortment of over 5,000 different tiles in-stock, Jeffrey Court is a valuable resource for the tile and stone community. We strive to preserve and impart the rich traditions of California tile making, capturing the classic elements of the past while satisfying today's leading design and color trends. To enhance our handmade tile collection, we also travel the world working with artisan factories to acquire specialized tiles that meet the fashion and quality demands of our customers. Chapter 2 Island Shades reflects the blue and green hues of the sea, lush greens of the mountains and tans and whites of the beaches found in Hawaii and the Caribbean. Bring a touch of paradise into any residential or commercial application with this clean and contemporary tropical themed collection.Images of palm trees, waves and plumerias on relief deco tiles coordinate perfectly with unusual sized 4" x 16" field tiles. Big, beefy antiqued mouldings are designed with irregularities to emulate the handmade tiles of years gone by and will add a dramatic statement to any installation. Island Glass "Crystals" Decors sparkle like sunlight on the ocean and are the perfect accent combined with the field tiles.Chapter 2 offers complete flexibility for design inspiration. Crafted from durable terra cotta clay and finished with ceramic glazes, this series can be used for all interior residential and light duty commercial floors and walls, and is also suited for exterior applications. Create a laid back, tropical surrounding with Island Shades for bathroom, kitchens, hearth surrounds, cabanas or accent walls. As a plus, this is one of Jeffrey Court's most affordable "up-market" ceramic series. Chapter 3 "Stream Stone" brings a modern flare to natural stone. The all new Chapter 3 draws its inspiration from contemporary Scandinavian style known for modern, sleek, and functional beauty. "Stream Stone" Combines 13 beautiful natural stone mosaics, a wide variety of listello, border, cap and dome combinations, as well as three natural stone field colors to aid in the design of that perfect modern atmosphere. Whether a small upgrade, or a full sized renovation Chapter 3 is sure to "wow" the refined modern palette. Designed in the tradition of the arts-and-crafts movement, Artisan Heritage II captures the spirit of "craftsman" tiles with subtle colors and shapes that emulate the range of tiles made in the early 1900's. Using only lead-free glazes, Jeffrey Court has incorporated five rustic colors, two matte finished and three with a "crackle" feature to enhance the aged look of the tiles.chapter 5 offers a combination of artisan field tiles with coordinating handmade decors and dots with magnificent sculpted natural elements like fruits, flowers, animals and textures that speak to the design of the craftsman era. 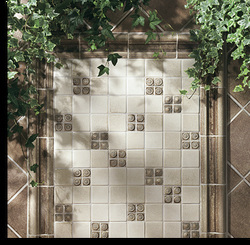 Six matching ceramic mosaic medleys complement the field tiles and will add texture and dimension to any installation. Unique 1" metal decors are available in five colors and work beautifully with the color palette. A variety of coordinating architectural mouldings complete the collection. Artisan Heritage II is ideal for interior walls and counters including showers, kitchen and bath walls and backsplashes. 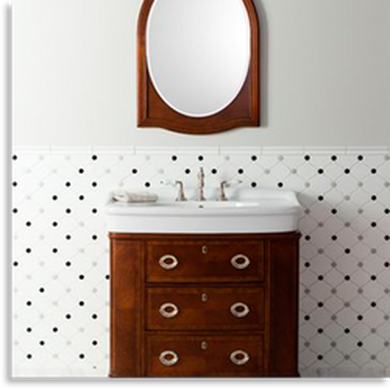 Use of the crackle finish tiles in food preparation counters is not recommended, but they are beautiful solutions for powder room counters. Chapter 6, Nob Hill is a collection designed with classic quality and good taste. Its reminiscent of the fine homes built in the city of San Francisco after the turn of the century belonging to oil tycoons and bankers living on Nob Hill. This chapter offers exquisite marble and metal designs in three colors - Crocker Gold, Huntington White and Stanford Beige with stunning color variations that add natural warmth and character.The artistic flavor of San Francisco is brought to life in this natural stone collection. Etched tiles and borders are stunning when lit with directional light. A variety of mosaic patterns allow limitless creative possibilities, and when combined with matching natural stone architectural mouldings, they offer a timeless and classic design solution. Distinctive metal decors and strips range from antique silver to rustic iron and are a wonderful accent with the stone.Nob Hill can be used virtually anywhere on floors or walls in residential and light commercial applications. Design options can range from Victorian, Classic, Retro, Rustic and Contemporary, and are limited only by the imagination. Uses include kitchen backsplashes, bathroom floors, counters and walls, showers, hearth surrounds, entryways and any installation where sophistication and elegance is desired. The highly anticipated completion of our new Chapter 7 Crossroads has arrived. Combining an ancient tile making technique called Cuerda Seca with bright, rich colors and multiple designs, Chapter 7 is sure to satisfy today's tastes and preferences. 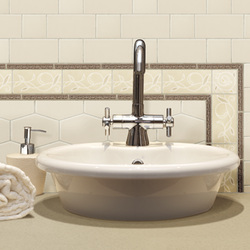 Chapter 8 Courtly is one of the crown jewels of Jeffrey Court tiles. 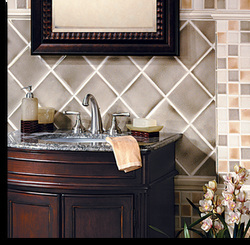 Jewel and crystal accents combined with uniquely designed ceramic tiles will make any installation sparkle like a brilliant piece of jewelry. The combination of shapes and sizes, glass and ceramic, crystal and metal will stimulate every facet of the imagination. Courtly is crafted in Southern California by master craftsmen in six exciting glaze colors - three matte and three gloss, one of which is a crackle glaze. Six sizes allow unlimited design options for unique installations. 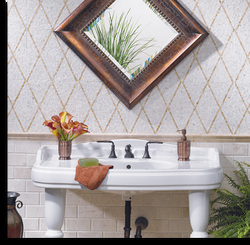 Mesh mounted mosaics in a variety of glass and metal combinations, some with distressed edges, have a beautiful Mediterranean look and will add drama and elegance to any space. Brilliant crushed crystal decors combine the sparkle of glass with embossed ceramic and were specifically designed to complement every element of Chapter 8. A large selection of architectural mouldings in the six colors of the palette complete the Courtly collection.Use Courtly on any interior wall or counter including kitchen backsplash, bathroom counters, tub surrounds, hearth surrounds, and wainscot walls in residential or commercial spaces. The colors combine beautifully with natural stone floor tiles from Chapter 18, Mozart's Mosaics. Pietra Opus translates to "stone compositions". The beautiful array of stone elements can be combined to create a dramatic composition using the stone and glass mosaics, stone accents, travertine and slate tiles and mouldings to create an installation reminiscent of old world construction.Stunning floor tiles are available in the most sought after stones - travertine, onyx, quartz and slate in the most popular color choices. The travertine floor tiles are available in a straight or rustic edge as well as in modular selections. 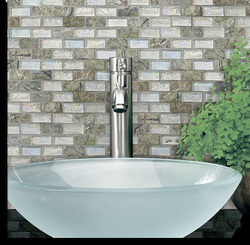 Matching stone and glass mosaics and decorative elements and split face mosaic sheets allow for numerous design options. Pietra Opus is equally at home in a rustic country home or urban loft and can be used virtually anywhere in residences on floors or walls. It even is suitable for medium duty use in commercial installations. 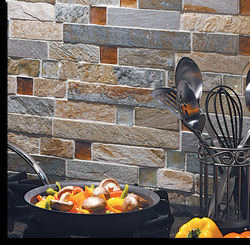 Create a spectacular "stone composition" for kitchens, bathrooms, accent walls and patio settings for a space that will be enjoyed for a lifetime. Chapter 10, Casual Elements is a distinctive ceramic collection with a rustic matte finish that will offer numerous upscale design possibilities. Traditional-shaped field tiles are designed to complement a unique selection of decorative tiles in shapes including rectangles, squares, rhomboids, triangles and pickets. Matching architectural mouldings and decorative trims add the finishing touch and make Chapter 10 very versatile for any design criteria.Unique to Casual Elements is a series of 10 stone matrix mouldings in patterns that look remarkably like the real elements that inspired the design: Jute, Raffia, Grass Cloth and Leather, just to name a few. Combine with matching Chapter 10 field tiles for an extraordinary effect.The entire collection has been designed to work beautifully with many natural stones including slate, quartzite, limestone, travertine and granite. Its contemporary, yet casual design is ideal for any interior wall or counter including kitchens, bathrooms and tub surrounds, hearth surrounds and wainscot walls. The field tiles are not recommended for floors. Chapter 11, Antiquity is a magnificent natural stone collection that is unparalleled for creating beautiful spaces with distinctive design elements. The name, Antiquity, describes exactly what Chapter 11 natural stone presents, very old stone "worked" by artisans to create forms and shapes that emulate patterns from ancient Rome, Pompeii, Ravenna, Luxor and Istanbul.The collection features three basic colors; Walnut, Alpaca and Almond Crème in a variety of floor and field tiles. Modular floor tiles have an "antique" finish with a pillowed edge and slightly irregular "brushed" surface. Field tiles feature a tumbled edge. Stunning 18" x 18" travertine and marble tiles in Ivory, Parma and Noche offer dramatic choices for floor and wall applications. Combine with a wide variety of mosaic patterns, micro mosaic listellos, strips and decorative mouldings for endless design possibilities. Unique to Antiquity are intricate Micro Rosoni panels that can act as a design focal point in upscale installations and were featured in the kitchen backsplash at a recent Greystone Mansion Showcase House in California.Use for kitchens, bathrooms, hearths, accent walls and patio settings for a timeless elegance and sophisticated design that will assure a lifetime of enjoyment. In Italian, the basic meaning of Campagna conjures up images of the old worked or old country. The look and feel of Chapter 12, Campagna with its rich and varied rustic coloration brings "aged" beauty to a new dimension. Equally at home in a Tuscan farm house or a Florentine villa behind elegant wrought iron gates, Campagna can now bring that sense of style to urban and country homes in America where rich, rustic beauty is desired.Made In California, by skilled Jeffrey Court artisans, the manufacturing process gives Campagna its unique characteristics of a tumbled rustic edge and unique deep glaze with color variation for a very "up market" look. Brilliant glass décor pieces and exquisitely designed mouldings provide an exceptional accent to any Chapter 12 installation.Chapter 12 is ideal for kitchen and bath on interior walls, backsplashes. Field tiles are not suitable for floors. We also do not recommend the crackle finish for horizontal food serving or preparation areas such as kitchen counters, but the tiles work beautifully for powder rooms and bathroom counters. Olde California, brings the rustic warmth of the early California missions and haciendas throughout the Southwest, to any installation. 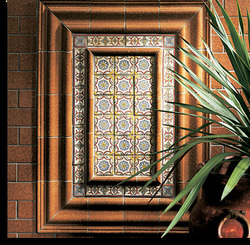 This collection of terra cotta tile is handmade by Jeffrey Court artisans in California, using a time-honored tradition that produces tile reminiscent of another era. 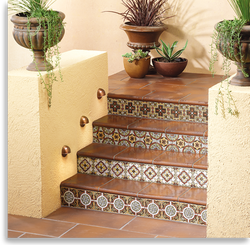 The hand-painted Décor tiles and borders perfectly capture the beauty of the Spanish colonial style.This collection includes floor and wall tiles made of extremely durable terra cotta clays that come in five glazed field colors and a natural, unglazed terra cotta paver. Matching "beefy" antiqued mouldings with designed-in irregularities remain true to the design of handmade tiles from the past and add authenticity to the installation.Chapter 13 terra cotta tile is suitable for any interior wall application or light duty floor. 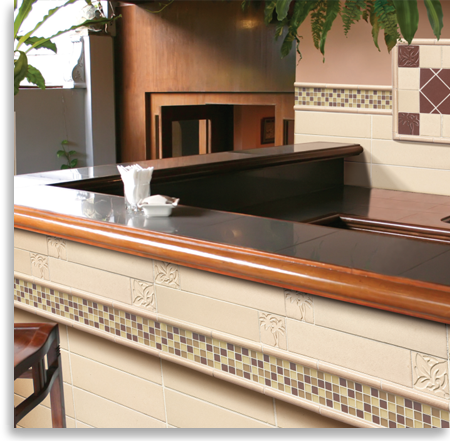 Powder rooms, hearth surrounds, wine rooms, stair risers, koi ponds, fountains, outdoor kitchens and fireplaces, kitchen backsplashes and tub surrounds are just a few of the possible applications for these beautiful terra cotta tiles. Imagine the surface of a pond during a gentle rain and you can visualize the beautiful surface of Raindrops II. 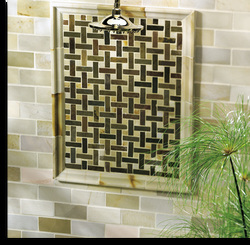 The collection features a combination of glass and mixed stone-glass mosaics, many with concentric series of wave patterns that will add an iridescent luster to any upscale design.The glass tile features an emulsified color-through body unlike many "painted back" mosaic glass tiles and a full 5/16" thickness that makes installation easier. Eight coordinating dome mouldings are designed to complement the collection and will add a finishing touch to any design.Chapter 14 Raindrops II will make a dramatic statement in interior and exterior wall surfaces that include pools, spas, fountains, tub and shower enclosures, hearth surrounds, barbeque facades and kitchen backsplashes. The collection will integrate beautifully with many other Jeffrey Court stone and tile products to offer a variety of up-market design possibilities. Named after the famous marble from Nothern Italy used to create the some of the world's most beautiful statues, Chapter 15 Statuario is a 100% natural marble stone collection. Not to be confused with less expensive and greyer White Carrara, Statuario a more "precious" white marble that features spectacular random streaks of gold to grey and is a classic color of timeless beauty.Offered in two finishes, polished and brushed, Statuario also includes a magnificent selection of dramatic sheet mosaics in various colors and shapes to offer limitless design possibilities. 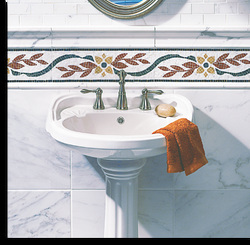 Distinctive micro mosaic borders and listellos add drama when combined with the beautiful white marble and can be used as a floor inlay around a room's perimeter or as "stone carpets". Matching architectural mouldings complete the collection.Chapter 15 can be used virtually anywhere in residences on floors and walls. It is a durable, and resilient surface that also can be used for medium duty commercial floors. 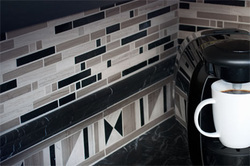 Statuario will add classic sophistication to any upscale master bathroom or entry, particularly in combination with a dramatic mosaic border and honed architectural mouldings. Provence, in Southern France, borders the Mediterranean and is famous for wine, food, beautiful mountains, vineyards and fields of lavender. 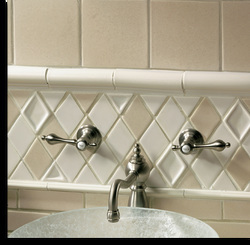 Chapter 16, Provence captures the motifs of this region with colors that are soft and versatile, mimicking the pastels made famous by renowned French painters.The finish of Provence tiles are a satin matte smooth glaze with crackle properties, inspired by French heritage tiles known as Faience. They are available in a choice of modular field tiles, in Springtime, a pale green and in Autumn, a warm tan. Combine with heavily moulded décor pieces that will add dimension and personality to any design. 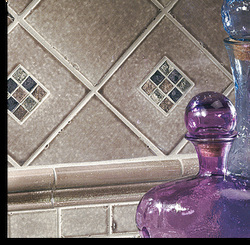 Artisan glass liners reflect the subtle tones of the tile and are the perfect accent with matching architectural mouldings completing the collection.Provence would enhance any interior wall application including kitchen backsplashes, tub surrounds, powder rooms, wine cellars or even hearth surrounds. The soft shades are very versatile and will endure the test of time. Field tiles are not recommended for floors or kitchen counters. They are however, wonderful for bathroom counters. Chapter 17, Irish Ice is inspired by the Celtic designs found in churches, government buildings and castles from the middle ages. Unique crackle glazes give the tile the appearance of having small ice crystals on the surface that looked like cracked ice in deep translucent pools. 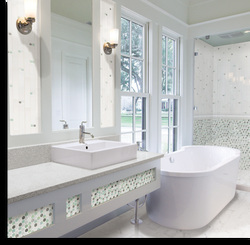 The effect gives a tremendous depth of color not normally found in glazed tiles.Field tiles in assorted sizes coordinate with 2" x 2" mosaics and complement unusual frosted glass mosaics that were specially selected to work with the Irish Ice color palette. 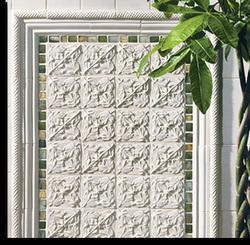 Embossed decors of Celtic origin offer opportunities for a truly unique installation design. They can be used as spot decos to draw interest to an accent wall or as a repeat pattern in a larger area. Matching architectural mouldings complete the collection.Chapter 17 is ideal for installations on kitchen, bath or powder room walls and exterior walls not subject to freeze-thaw cycles. 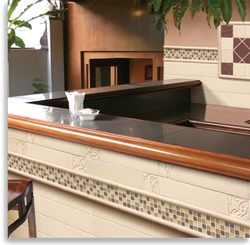 The unique decorative colors and themes also offer creative options for restaurants and commercial installations. We also do not recommend the crackle finish for horizontal food serving or preparation areas such as kitchen counters, but the tiles work beautifully for powder rooms and bathroom counters Frosted glass is beautiful on swimming pools, spas, bathroom floors and walls, kitchen backsplashes, exterior facades and steam rooms.